Karen House : April 11, 2019, 12:30 p.m.
James Gang Amusements will provide a carnival for this year's Valley Fest. CORRECTION 4/11/2019 6:23 p.m.: The date of the Valley Fest Road Race has been corrected. April 11, 2019 – A carnival, fireworks, and a new location are all expected to attract a big crowd to the 2019 Valley Fest celebration, set for April 30-May 5. In its 9th year, Valley Fest has outgrown its previous location in the heart of downtown Dunlap, and is moving to the 17-acre Valley Fest site at 287 Pine Street. Now equipped with utility hook-ups, the large field will allow the added attractions expected this year. 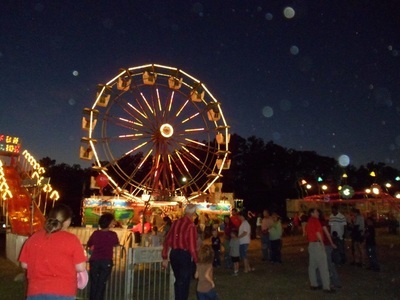 A carnival will set up on the back side of the property for the full week, and fireworks will be launched from the same location Saturday at 10 p.m. This is the first Valley Fest to include a carnival, which will set up at the beginning of the week and will be open for business starting April 30. James Gang Amusements will bring in the carnival, complete with an 80-foot Ferris wheel. Saturday, May 4, runners will launch from the entrance of Valley Fest for the annual Valley Fest Road Race. The annual event features a 5K race, a 10K race, and a 1-mile walk/run, with racers crossing the finish line to live music on Cherry Street, next to The Vine. The annual Art & The Library Exhibition will be held all weekend in the City Training Center. Last year's People's Choice Award went to Shauna Braun's walking stick with a snake and a frog carved into the wood. This walking stick was last year's winner at the Art Exhibition. There will also be a car show all day Saturday, on Rankin Avenue. And of course there will be dozens of food and craft vendors, who will be setting up on Thursday. With three days of music lined up, all on one stage, there will be something for everyone. Friday, May 3, Jill's Kids take the stage, performing from 3:30 to 10 p.m. After that, the schedule is as follows. Admission to Valley Fest is $10 for adults and $2 for children 10 and under. Wristbands that allow free access to the site for the week are $12, available from local banks and businesses and the Dunlap-Sequatchie Chamber of Commerce. VIP seating is offered on the Valley Fest website.